In 1895 became the first church edifice after moving from the home of the founders Rev. & Mrs. Robert Wyche. Affectionately known as the “little church on the hill”. The Sanctuary was heated by a pot-bellied stove fueled by coal. The members took great pride in the upkeep of the church and raised funds baking pies, cakes, and selling dinners - which eventually included adding stained-glass windows. Students from Morris Brown College and other schools in the AU Center would come to worship. In 1948 a devastating fire occurred in the church. Services were then held in the Chapel at Morris Brown College until a new home was found. The new home discovered by the late Mrs. Louise Henderson, located at 491 Chestnut Street, NW was agreed upon by the Church Body and the 6th Episcopal District of The AME Church. Rev. A.J. Harris, then Pastor, led the Congregation to the new Church Edifice in 1948. The huge stone edifice, formerly the historical Western Heights Baptist Church, was said to be a hiding place for soldiers during The Civil War. St. Mark then became one of the largest AME churches in Atlanta, hosting many large gatherings within the church and the community. 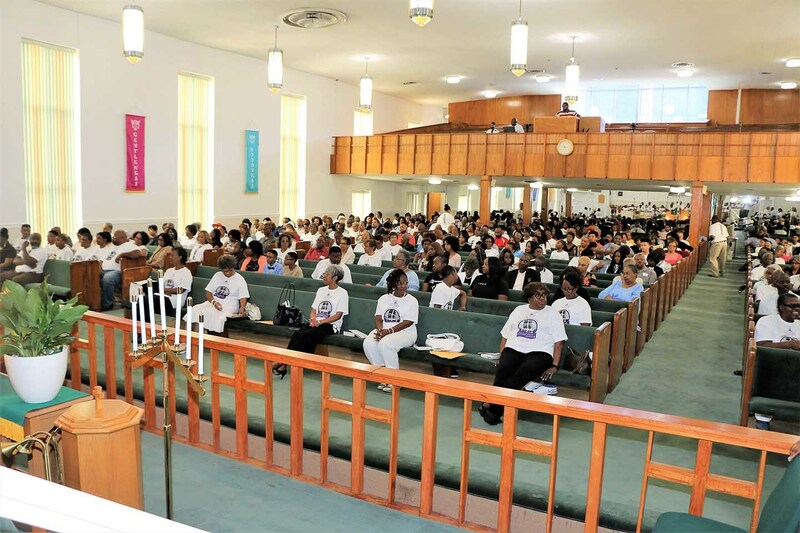 Several Atlanta-North Georgia Annual Conferences convened in our Sanctuary. Booker T. Washington High School once held their Mid-term Graduations at St. Mark. Some of the notable speakers who graced our congregation were: Mrs. Lillian Carter, Mother of former Georgia Governor and U.S. President James Earl Carter; The Honorable Governor Herman Talmadge; and The Honorable Mayor Maynard Holbrook Jackson. Our church has always had outstanding Gospel preachers, great choirs and musicians, a wonderful Sunday School, dedicated organizations, including a very active Youth Department which included Boy Scouts, Cub Scouts, Girl Scouts and Brownies. A major fundraiser for the church was “The Parade of Flowers”, a project introduced by Rev. D.T. Babcock. This project brought in thousands of dollars by the congregation. It was a competition where the winner was crowned Ms. St. Mark and Mr. St. Mark for the year. Many memorable events occurred at this site that will go down in history such as “The Tom Thumb & Womanless Weddings”. One major problem with our church at 491 was we did not have any parking space. Parking was on the street. A small lot located in the rear of the church was allowed for our use by the English Avenue Primary School. This was our home until 1976. Under the leadership of our pastor, then Rev. Preston Warren Williams, II (and later served as Presiding Prelate of the 6th Episcopal District), the Congregation decided it was more feasible to find a new home than to try to purchase and develop land in the area. After much searching, a new home was found. This site (formerly Ben Hill Baptist Church) became our new home in June of 1976. What a Blessing from the Lord! Located on 13+ acres of land at the intersection of two major highways – GA Hwy 166 and Interstate I-285. In the early days, Rev. Williams and the St. Mark family sold BBQ sandwiches on the corner. Later we leased the BBQ house. Many of our present-day dedicated members from 491 made the journey to this amazing campus and soon we added many more dedicated members to the great St. Mark family. The old Ben Hill Baptist church served as a gymnasium with game rooms and a computer lab. The building eventually had to be demolished to make way for the Renovation of the Educational building. The educational building housed The Sunday School, Day Care Center, and 3rd floor office spaces which included The Local NAACP office under the leadership of the late Mrs. Jondell Johnson. Also the offices of SWEEAC and a Music Studio. Quality Living Services, the first center primarily for African American Senior Citizens in the Atlanta area was founded here at St. Mark. Under the leadership of our former pastor, Rev. Larry W. Hudson, Sr., complete and extensive renovations to the education building and the Sanctuary were made which included the addition of a wonderful elevator which connected all levels of the Sanctuary and educational building. The Administrative offices , Book Store, Conference Room, First-aid Room, and The Molock Center Dining Hall where many noteworthy events have been held. The 3rd level has been occupied by schools and the lower level houses the food pantry. Other ministers who have impacted this site are: Rev. Charles Purnell, Rev. Charles Wells, Rev. Daniel Jacobs, Rev. T. Nathaniel Hercules, Rev. David B. Rhone, Rev. Walter E. Daniels, and Rev. Bertram C. Smith. Our current pastor/shepherd, Rev. Forrest Dickey, took the helm during the 2018 conference year and has embraced the St. Mark family. His clarion call, “Don't Miss the Mark” inspires and uplifts. It does not yet appear what blessings await us. Many notable speakers, including our own late Dr. Asa G. Hilliard, who enlightened our minds with our great African Heritage, have graced our congregation. Members from all three edifices have served as local NAACP presidents – The late Dr. Otis W. Smith, 33 Chestnut St., The late Bro. James Couch, 491 Chestnut St. and our former Mayor of East Point, Mrs. Patsy J. Hilliard, who still serves here at the 3605 Campbellton Road location. St. Mark continues to provide for our senior citizens, our youth, the entire St. Mark family and the community through the many ministries which provide involvement for all ages through the Sunday School, Bible Study, Church organizations and Auxiliaries.